• The NT has no grip range. It can be installed in any material thickness. But the hole size will vary in dimension and is based on the material thickness. The thicker the material the larger the hole. • Threads in this part are made oversized because the nut portion shrinks as it is drawn into the sleeve. The installed thread is compatible with standard screws after installation. 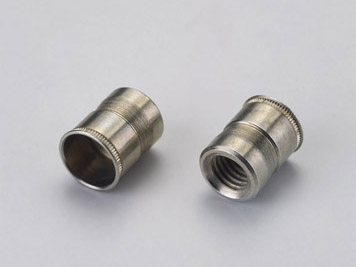 • The NT has the smallest backside protrusion of any rivet nut or threaded insert making it ideal for applications with limited backside space requirements. • The NT is available in open and closed end in steel, aluminum, brass and stainless steel. • 4-40 to 1/2-13 and M3 to M12. • See page 29 for dimensional details and part numbers.